Agrane Peryval is a merchant who can be found at his campsite north of the Windward Ruins, just outside Dawnstar. You will be directed to him as part of the related quest, although you do not need to purchase anything from him. 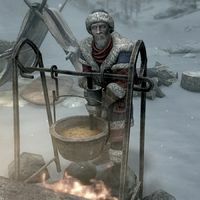 Among his wares, he sells three sets of Saturalia clothing items (Saturalia Boots, Saturalia Clothes, Saturalia Gloves) as well as a bill of sale for the nearby reindeer. Saturalia Preparation: Track down a traveling merchant to take part in end-of-year festivities. This is the merchandise found in Agrane's merchant chest. These items are only available if purchased from the merchant; they cannot be pickpocketed or stolen. They are restocked every two days. This page was last modified on 26 March 2019, at 23:30.